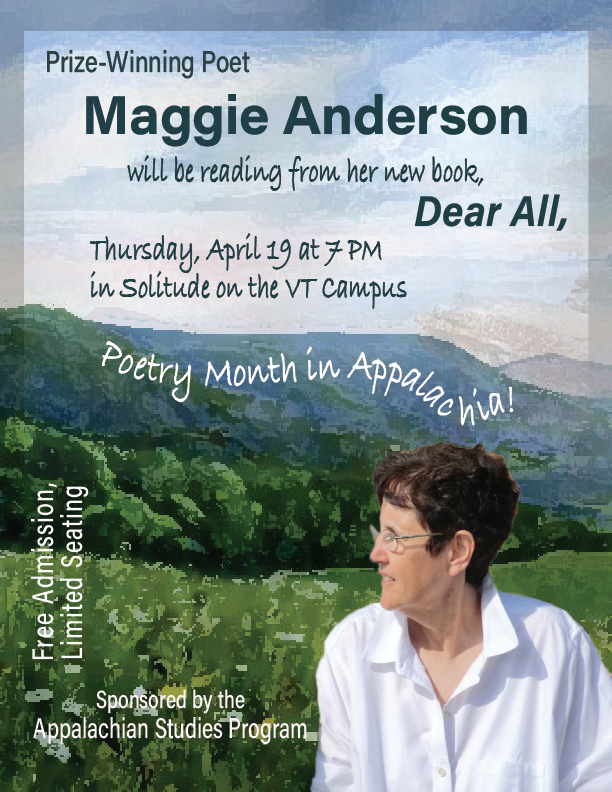 The Appalachian Studies Program at Virginia Tech and the Solitude Preservation Fund present a Poetry Reading with Prize-Winning Poet Maggie Anderson on Thursday, April 19, 2018 at Solitude on the campus of Virginia Tech. Celebrate Poetry Month in Appalachia with a reading from prize-winning poet Maggie Anderson who will be reading from her new book "Dear All" and discuss her work in the context of the Appalachian region. Solitude is located at 705 West Campus Drive in Blacksburg, VA on the campus of Virginia Tech. To view the event flyer, visit: https://i.imgur.com/EK5cA81.png. For more information, visit: https://www.facebook.com/SolitudeVT/ or http://www.calendar.vt.edu/main.php?view=event&eventid=1523389457536.